What makes a good e-moderator? What skills and qualities does the online tutor need? I asked our team of very experienced e-moderators what they thought the most important online skills and qualities were, and below are some of their responses. Develop an effective online PLN (personal learning network) that works for you. It is important for tutors not to get so bogged down in the day to day tasks of the job that they neglect their own longer-term professional development. How? If you don’t already use Twitter, try it out (see this user guide to get started). Subscribe and keep up to date with blogs written by professionals in your area of teaching – there’s a good blogroll for ESL/ELT on Lindsay Clandfield’s blog. No one learns anything from uninterested or unmotivated teachers, whether f2f or online. An inspired teacher produces inspired learners. How? To maintain enthusiasm for your online work ensure that you have enough time to devote to your online students, and that there is enough variety in your work to keep you engaged. And of course, experiment and learn through your own teaching. Online this involves completely new skills, ie. “reading” between the lines. How? Show you are really listening to your online students by picking up on points made earlier (perhaps weeks earlier) as well as choosing written words carefully to engage in true dialogue and create a comfortable learning environment. This is about being there but not dominating the online environment. It’s often more about the exchanges and the doing than you transferring your knowledge. How? It’s not just a question of being present (e.g. via forum responses or Skype office hours) with answers or positive feedback but involves the skill of knowing when to step in to direct as well as stepping back to allow greater peer-interaction without disappearing. Good tutors have the ability to explore ideas and develop arguments, promoting valuable threads. How? Read and write carefully, and ask good questions. This can help to make forum discussions more engaging. There is room in any online course for simple forum posts, but it’s much more engaging to read and post in a thread which is a real discussion. It’s important to know when to intervene and when to hold back, providing enough support, but not eliminating challenge. How? Experience, and trial and error are probably the only ways to learn this one. How much scaffolding to provide your learners will of course depend on the online group too, as well as the subject matter – e.g. how much the group already knows about it. This allows the trainer to view the elearning process from the perspective of the participant when developing and moderating activities. How? There is nothing as effective as doing an online course yourself to experience what it’s like to be an online student! It doesn’t have to be in the same subject area that you teach online, but could be in any area that interests you – the main point is to be on the receiving end of online teaching. It can be a real eye opener in terms of seeing what works and doesn’t online. 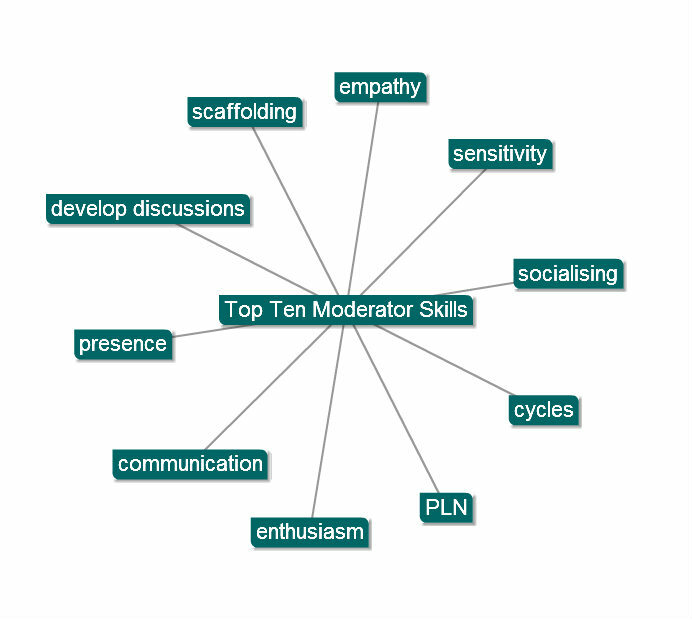 This enables the moderator to respond to and make the most of different learning styles and cultural differences. How? Do a little research on the learning cultures and learning styles of your online students, either before or at the start of the course. Getting your online students to complete an open ended questionnaire about their expectations of online learning and your course, and about what works and doesn’t work for them in terms of learning activities, can also provide valuable insights. You could revisit this periodically e.g. in midcourse feedback. We all know that fully online courses can lack the essential social element that face-to-face classes provide. An initial socialising stage with specifically social tasks in an online course is important, but after that, what can we do to ensure that groups gel and continue to work well together? How? Keep feeding the social aspects of the course through cafe postings or sharing photos. Not too much, not too little. Friendly Monday a.m. posts seem appreciated. Regular synchronous video sessions also help of course, and meeting up in 3D virtual worlds such as Second Life can greatly enhance the sense of social presence on an online course. A course has its own life cycle, with a beginning, middle and end. Be very aware of each of these stages within your course, and consciously cater to each of them. How? At the beginning of the course, create a warm atmosphere, and then continue to encourage and scaffold so participants learn as much as they can. At the end of your course let participants feel a sense of achievement and also experience ‘closure’. Loads of participants write to me at the end of a course saying they feel a bit bereft when they check their mails and there are no more emails from the others and there are no more forum discussions to join. So, above we have a list of just 10 key tutors skills and qualities – of course there are many, many more! In fact the more you tutor online, the more skills you realise you need, in my experience! What about you? What are the key e-moderator or online tutors skills for you? Thanks for sharing this very useful blog with us. It has everything to do with my reality nowadays, and all of the skills you and your colleagues mentioned are extremely important. In my case, for 2010, I want to give an even better support to the e-tutors that I’ve been working with by effectively using the skills you mentioned. Thanks for your comment Carla, I believe you’ll be moderating on the fantastic (free) EVO online courses, which I highly recommend to any readers who don’t know them to check out http://evosessions.pbworks.com/Call_for_Participation2010. I’d love to hear about your own e-moderating experiences at some point, and what skill is most important in your view too. Good luck with the EVO sessions! Well that’s a nice spontaneous example which illustrates the the skill of sharing too which involves hyperlinking to resources and pointing trainees in new directions. This also relates to the skill of juggling a mixture of goals and/or mixed ability groups. It’s quite common online to have a less homogenous group – for a start trainees or students all have varying degrees of comfort and experience with web platforms and tools. I would also add the skill of apologising. Face-to-face, when a teacher forgets to hand back a marked essay or bring in an article they promised, all is forgiven with a simple smile. Online it takes a few more words and I find it’s important to openly and warmly say “I’m really sorry etc..” even for small things such as broken links or a missing resource because this lessens any possible irritation and helps show the e-moderator is human too! Thanks Nicky for the great collaborative post and opportunity to discuss, useful for newbie e-tutors and experienced ones too, always good to compare and reflect! Thanks Vale, and your post reminds me of another skill which I think is imortant – praise. Overtly praising your online students for their contributions and achievements is hugely important, no matter how high-powered your learners might be (or think they are). I found this when I first did an online course as a particpant back in 2000. I found myself really appreciating praise or a little pat on the back from my tutor, certainly for my first few contributions to the course… Or perhaps I’m just a saddo who needs constant confirmation from others! I wonder if anyone else has experienced this strong need for praise and affirmation from the tutor on an online course? In my experience it’s much more necessary (at least for me) online than f2f. It was interesting to go through the tips.I have even got it mailed to my email account to share the information with others. Hi Nicky, I know I’m joining this discussion incredibly late, but as it popped up on my twitter screen just as I’m starting your online etutoring course, it was too big a temptation to resist. Hi Ceri – comments are welcome any time! We’re delighted to have you with us on the E-moderation course, and I know you’ll have plenty of insights to share with the group based on your own experience. Looking forward to it!